Tim Lynch is vice president of sales and marketing for Kenmode Precision Metal Stamping, Algonquin, IL, tel. 847/658-5041, www.kenmode.com. With the market for implantable medical devices growing rapidly, manufacturers are developing amazing new therapeutic technologies for orthopedic, cardiovascular and other conditions. Metal-stamping firms must be equipped to support that innovation and assist OEMs in speeding time to market for new devices. Production equipment represents a major component to success in medical. For its part, Kenmode employs the latest manufacturing technology, from high-speed precision presses to in-die protection systems to an advanced video-inspection system that ensures quality in every part. The company is experienced in forming a range of materials, including beryllium copper, pre-plated alloys and custom-shaped wire, with tight tolerances. Stock thicknesses measure from 0.0015 to more than 0.125 in., in widths from 0.25 to 23.5 in. Presses include 10- to 200-ton machines from Bruderer and Nidec Minster, operating at speeds to 1800 strokes/min. and with bed lengths to 84 in. 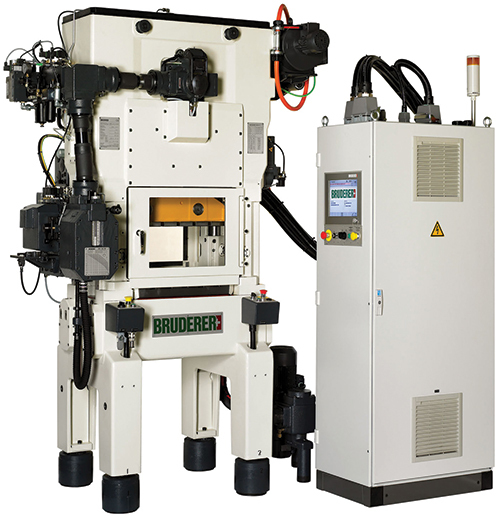 Many of Kenmode’s presses employ electronic servo feeds to reduce setup times and prevent misfeeds. Mechanical-press manufacturers have gone to great lengths to evolve technologies that deliver, at high speeds, precision parts such as those needed to satisfy demanding medical customers. Refinements have addressed proper distribution of the load acting on the press ram. This includes designing absolute minimum clearance in the main and connecting-rod bearings. To prevent deflection of a tool’s upper die due to eccentric loads, presses may have ram-guide elements placed in the same plane as the strip. Besides protecting the press and helping to ensure precision, quality parts, this design can decidedly increases a tool’s service life. More responsive clutch and brake units deliver minimized braking distances. And, short braking angles designed into some presses produce an almost immediate stop of the punching process when, for example, a stop is triggered by the tool-monitoring system. Refinements such as these protect presses and tooling, and go a long way toward first- to last-part accuracy. To best serve manufacturers of short- or long-term implantable medical and surgical devices, metal stampers must offer these advanced capabilities. Delivering a new Class III medical device to market can be arduous, so speed is of the essence. When developing a new product, manufacturers seek suppliers that can provide prototypes faster than ever before. Due to the complexity of metal-stamped parts, in the past prototyping typically has taken from two to four weeks. Now, OEMs want stampers to produce prototypes in a matter of days. To deliver in such a short timeframe, metal stampers should have a dedicated prototype and R&D unit. At the same time, OEM engineers want layouts of the prototype’s critical dimensions in order to know if it differs from the expected production part. A reliable working prototype of the device is important so that clinicians can test it with a realistic look, feel and function. Hand in hand with prototyping is design for manufacturability. Metal-stamping firms can add tremendous value when their engineers are involved early on in the design phase by working with the OEM’s team on part design. With the move toward miniaturization of implantable devices, metal stampings are becoming smaller and more complex. At the same time, some of the specialty metals used in implantable devices, such as titanium, can be difficult to form in a stamping. Before the design of a metal stamped part is finalized, the metal stamper’s engineers should be consulted. The engineers often can suggest improvements to the design that can eliminate secondary operations or reduce the use of precious metals and related costs. Metal-stamping firms that work with innovative product designs rely on finite-element-analysis simulation software to determine how a part design will perform in production. For a new part design that may test the limits of metal stamping, engineers may run any number of different iterations of a simulation, showing how a tool will form a part and whether the metal specified will work within those limits. This capability can also speed prototyping by eliminating multiple iterations of prototype parts in favor of those most likely to succeed. Metal stampers should demonstrate their expertise in precision stamping through their ability to build and maintain the customized tool inhouse. In the past, the process of designing and building a tool has taken anywhere from 8 to 14 weeks, depending on the project. Now, OEMs may require a working prototype tool in less than a week. While that compressed timeframe is not always possible with a complex stamping that requires a progressive die, new technologies allow many metal stampings to be formed with a single-stage die set. The implantable and surgical medical-device industry must navigate the toughest government regulations in the world, courtesy of the U.S. Food and Drug Administration (FDA). For that reason, a stamper should be ISO 13485 certified and possess a quality system that matches the specialized needs of the medical-device manufacturer. Such a stamper also should be aware of FDA 21 CRF820.3 and quality-system regulations. A stamper should work with stringent validation protocols that follow the IQ/OQ/PQ process to ensure that critical-to-function dimensions are held for the new part. During production, advanced metal stampers rely on in-die sensor technology and digital inspection equipment for real-time quality control. Redundant presses of the same tonnage and manufacturer parameters also are important in order to ensure uptime. To avoid having to revalidate a new press in the event of a mechanical failure, stampers can validate two or more of the same presses with the die. Having multiple presses is an important factor in risk mitigation and ensuring a steady supply of parts, without the need for a change order.